From Betty's Soul Food Collection... Who says you can't have it all? 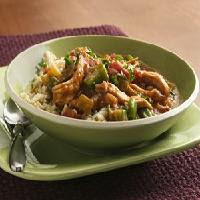 Our recipe makeover proves you can have Chicken Gumbo with authentic flavor and a complete serving of veggies--a smart bonus. Cook rice in water as directed on package, omitting butter and salt; keep warm. Meanwhile, in 8-quart stockpot or Dutch oven, stir flour constantly over medium-low heat until flour is deep brown. Remove from stockpot; set aside. In same stockpot, heat oil over medium heat. Add chicken pieces, onions, bell pepper, celery, garlic, bay leaves, thyme, salt and pepper; cook 8 to 10 minutes, turning chicken pieces and stirring frequently, until chicken is browned and vegetables are tender. Stir in browned flour, tomatoes, broth, browning sauce and pepper sauce until well mixed. Heat to boiling. Reduce heat; cover and simmer 50 minutes. Stir in okra; cover and simmer 20 minutes longer. Remove chicken from stockpot; cool about 10 minutes or just until cool enough to handle. Remove bones from chicken; discard bones. Cut chicken into bite-size pieces; return to stockpot. Cook until thoroughly heated. Remove bay leaves. Serve over cooked rice; sprinkle with parsley. Calories 300 (Calories from Fat 70); Total Fat 8g (Saturated Fat 2g, Trans Fat 0g); Cholesterol 60mg; Sodium 730mg; Total Carbohydrate 33g (Dietary Fiber 5g, Sugars 5g); Protein 25g. Daily Values: Vitamin A 8%; Vitamin C 25%; Calcium 10%; Iron 15%. Exchanges: 1 1/2 Starch; 1/2 Other Carbohydrate; 1 Vegetable; 2 1/2 Lean Meat. Carbohydrate Choices: 2. This entry was posted on 11:12 PM and is filed under Soup . You can follow any responses to this entry through the RSS 2.0 feed. You can leave a response, or trackback from your own site.